There is new evidence today of how the UK technology sector is feeling about its future after the referendum vote to leave the EU. And the message from a survey carried out by Tech City UK is pretty gloomy - though the organisation itself sees some reasons for optimism. Their biggest concern was getting access to talent - 51% said they thought it would get more difficult to recruit and retain the best staff. Just under a quarter thought they would scale back their plans for growth, and 31% said they would slow down on recruitment. But they are now looking forward and have demands of the government as it enters the Brexit negotiations. Of the employers surveyed, 70% wanted a clear message that EU residents could continue to live and work in the UK, and 79% wanted changes in the visa system to allow the best of global talent to come here. They would also like a cut in business taxes. But the clearest message is on continued trading relationships with the rest of Europe. Eighty five per cent of respondents wanted to see the government negotiate to remain part of the Single Market. They may be cheered by the fact that the new Prime Minister, Theresa May, said this month that it was "a priority to allow British companies to trade with the Single Market." But then again she said it was also necessary to "regain more control of the numbers of people who come here from Europe," so they will have to wait to see how she squares that particular circle. Tech City UK, the organisation set up by the government to promote first London then other cities to technology investors, is determined to be cheerful. The press release it sent out with the results of this rather downbeat survey was headlined "Cause for optimism as tech rises to Brexit challenge". 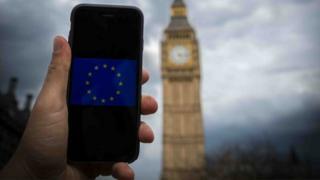 Its chief executive, Gerard Grech, insists he is beginning to see some of that hope shining through and "there are unexpected upsides and very real opportunities" in the post-Brexit world. After all the pre-referendum concern about investors pulling back, there have been several announcements in recent days about UK tech firms receiving new funding. The giant US investor KKR put £50m into the security firm Darktrace, the London-based currency exchange app Revolut raised nearly £8m and a music tickets site Festicket was backed with nearly £5m. What we do not know, of course, amidst these good news stories, is how many firms failed to get funding they had expected before the referendum. At a tech gathering last week, one executive of a start-up told me why he thought its prospects in a very competitive sector were now brighter: "we've got funding, nobody else will get it now," he said. But Gerard Grech seems happy enough to wave goodbye to the kind of investor who is put off by Brexit fears: "Those who were fair-weather friends will seek easier ways to make money, and we will be better off without them." What is clear is that the UK still has plenty of smart young tech entrepreneurs with ambitious plans. Many were certainly disappointed by the referendum result and believe it has made life tougher - but they are still confident in their own abilities and will be pressing the government to put as few barriers as possible in their path to a profitable future.